1. Preheat the oven to 160˚C, gas mark 3; grease a 20cm round cake tin and line the base and sides with baking parchment. Using electric beaters, cream the butter and sugar together until light and fl uffy – about 3-4 minutes. Beat in the honey, then the eggs, one at a time. Combine the dry ingredients, adding a pinch of salt, and fold into the creamed mixture, then stir through the apple chunks. 2. Tip the mixture into the tin and arrange the sliced apple over the top. Bake for 1 hour-1 hour 15 minutes, until set on top and a skewer inserted into the centre comes out clean (cover loosely with a sheet of foil after about 45-55 minutes if it starts to look too dark on top). Cool in the tin. 3. Remove from the tin. Warm the remaining 50g honey in a pan or the microwave, and spoon or brush over the cake. 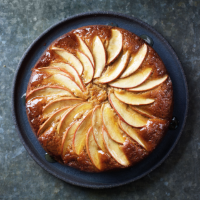 This cake is equally good made with pears, adding 1 tsp mixed spice instead of the ginger.